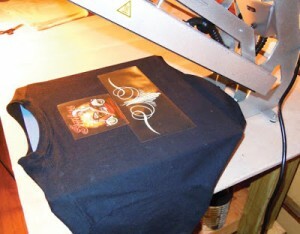 Did you know that you could also “flash press” FlexCut™ Sticky LT onto regular cotton fabrics and cotton blends? By heat pressing FlexCut™ Sticky LT at a temperature of 320°F (160°C), you can reduce the pressing time to only 9 seconds. That’s a savings of 8 seconds per piece. Over the course of a year that 8 seconds can add up to big savings. Let’s imagine that you typically heat press 400 garments a day. By reducing pressing time by 8 seconds, you save an hour each day. At an average of 220 working days a year and a burdened hourly shop rate of $75 per hour, your annual savings amounts to more than $15,000.